Heartfelt Good Times "Deep in the Heart of Texas"
Every gathering of paper doll enthusiasts is more like a lively family reunion than a gathering of serious conventioneers. Of course, every one of the over 100 attendees shares a serious passion; a love of paper dolls, both vintage and current. 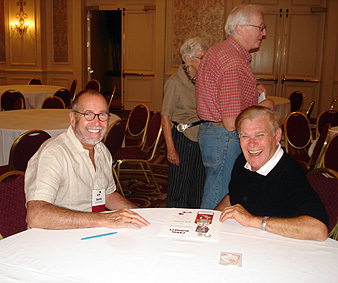 Many familiar faces, pillars of the paper doll community like Gene Maiden, Tom Tierney, Deanna Williams, John Axe, Joyce McClelland, Garth and Diana Lax, Jim Faraone and so many others, made this year’s convention seem like old home week. However, there were plenty of new faces too, making it apparent that the joy of paper dolls is a growing enthusiasm. San Antonio, Texas, was the setting for the August event organized under the guidance of Joyce McClelland and her hard-working committees. The air conditioning of the Westin Riverwalk Hotel was a welcome relief from the heat, humidity and the daily downpours that caught many a conventioneer without an umbrella. The picturesque city, home of the Alamo and the famed Riverwalk provided an evocative venue, rich in history. Some of that Tex-Mex history was brought to life by the informative and humorous commentary offered by the guides during the opening day’s barge tour of the beautiful river lined with romantic old buildings and lush vegetation as it snakes through the city. Registration was just the beginning of the fun. Everybody was issued with a brightly colored straw hat and given free reign of tables loaded with do-it-yourself decorative materials like feathers, ribbons, sequins and novelties. By the very first evening, many creative closet milliners were sporting fantastic chapeaux that could give Ascot a run for its money. Later, a contest was held and judges Brenda Sneathen Mattox and Jan McKay somehow managed to choose three winners from the bevy of headliners. They were Shirley Klein, Teri Pettit and Mary Sabourin. Sharing one’s collection and talent is such an important facet of the conventions and there were two popular events that gave attendees a chance to inspect the current work of today’s artists and also the gems of private collections. After Friday’s dinner, the ballroom was transformed from salesroom to gallery and more than a dozen artists displayed their original artwork. The most exciting artwork on display was a very special exhibition of the lovely, delicately executed paper dolls created by Helen Page. Mrs. Page was later presented with the prestigious Fanny Gray Award at that evening’s celebration. She is 91 and still creating but could not attend. She was represented by her daughter, Margaret and her granddaughter. Once again, on Saturday afternoon the ballroom changed its function and became a museum of sorts, displaying special paper dolls entered into competition by collectors. Some were antiques, many vintage and a few were brand-new. Many categories assured that more than a few entrants happily received ribbon awards. After viewing all the entries, viewers voted on their favorite and I am proud and touched that my late brother, Poncho Wolfe’s Liz Taylor paper doll book of costumes was chosen as Best of Show and awarded a splendid blue rosette ribbon. Both collecting and creating were covered in the seminars and workshops held on Saturday. Everything from organizing one’s collection to coloring black-and-white paper dolls encouraged artistic endeavors, and Tom Tierney’s talent for telling tales held his audience spellbound. Even when he wasn’t “officially” speaking, Tom’s wealth of stories made him one of the convention’s star guests. He eagerly shared the news of his forthcoming relocation from New York State to Deep in the Heart of Texas, his birthplace. John Axe was the master of ceremonies for the evening events. His dry wit and funny banter with Jim Farone as they distributed the raffle prizes to the many winners had the audience in gleeful high spirits. Every paper doll souvenir given at the meals carried the Texan theme. The first book, by Bruce Patrick Jones, honored Audie Murphy, the most decorated soldier of the war who became a popular movie star. He was from Texas, of course. Friday evening’s dinner had a military theme because San Antonio was such an important city for training during World War II. I gave a presentation about wartime fashions, how and why they developed and very often influenced the many highly collectible paper dolls of the time. I created a souvenir book containing several of those styles. Saturday’s theme was Hollywood and that evening’s souvenir was, fittingly, an epic book featuring all the stars of the 1956 movie, “Giant” including Elizabeth Taylor, Rock Hudson and James Dean. Artist Sandra Vanderpool shared how, when researching her meticulously drawn dolls and costumes, she had been given a special DVD of the film by one its stars, Jane Withers (who is herself a collector of paper dolls and often a popular guest at the Los Angeles parties). The Sunday brunch included a highly informative and interesting presentation by Diana Lax and revealed the 300 year history of paper dolls and, despite a small technical glitch, everyone agreed that we had learned so much about the pedigree of our hobby from ancient times right up to the present. Before bidding each other fond farewells, attendees were told about next year’s convention to be held in New Jersey. Linda Ocasio is heading the event and her committees are already at work as they begin to plan an exciting event with themes relating to Manhattan’s Broadway and fashion industry. Glamour will be running high, that is certain. It’s time to start counting the days until August 12th, 2008. And it’s time to send in your check, too!